The name Sigerson Clifford (1913-1985) might not be familiar to many readers, but the poet and playwright from Cahirsiveen, Co. Kerry retains much affection in Ireland thanks to the durability of compositions such as The Boys of Barr na Sraide (recorded by musicians as various as Séamus Tansey and Seán Garvey). 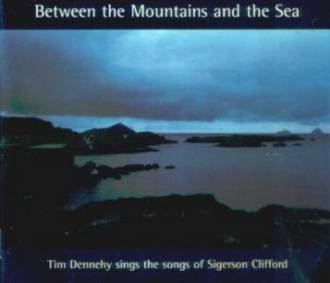 Originally from Ballinskelligs, further down the Iveragh Peninsula, Tim Dennehy has devoted himself to the maintenance of Clifford’s memory ever since the release of his first album, A Thimbleful of Song, in 1989 which included the setting of the poet’s The Ballad of the Tinker’s Daughter to music. This, his fifth album, is almost entirely to Clifford’s work (the exception being the title track which Tim composed while returning home to Clare after Sigerson’s funeral). Dennehy’s rich and expressive voice is ideally suited to his subject’s own articulate accounts of local life and events, rendered all the more powerful by his eye for an apposite metaphor and telling turn of phrase. Sigerson’s widow, Marie, also provides her own pertinent reading of another of his poems, M.J. McManus. Much is of the material is sung unaccompanied, thereby emphasizing the strengths of Clifford’s writing while the remainder is garnished by some of the subtlest arrangements of recent years, courtesy of the singer and his collaborator, multi-instrumentalist Garry Ó Briain. Additionally, the album’s beautiful packaging is enhanced by the inclusion of a superbly designed 48-page booklet replete with all the lyrics, superb recent and archive photography, reminiscences and even Sigerson Clifford’s funeral instructions! All it lacks (and it’s a huge pity that it does so) is a cogent, concise biography of the poet for those unsure of his importance. Nevertheless, this release’s essential value remains undiminished – not to be missed! This review by Geoff Wallis first appeared in fRoots magazine – www.frootsmag.com. For more information about Tim and Sceilig Records visit www.sceilig.com. The album is available for sale on-line at www.custysmusic.com and is distributed in the UK by Copperplate – www.copperplatedistribution.com.